Billie Giles-Corti and Associate Professor Bruce Campbell. Image: Irene Dowdy. The Faculty of Medicine, Dentistry and Health Sciences congratulates all award recipients, many of whom we are proud to count among our staff, alumni and collaborators. The winners were assessed by their peers as meeting the highest national and international standards for their research. They represent the top 17 applicants from over 6,000 funding applications NHMRC received in 2015. The top ranked application in the Program Grant scheme went to the Saving brain and changing practice in stroke project led by University of Melbourne Professor Steve Davis, Director of the Melbourne Brain Centre and Neurology at the Royal Melbourne Hospital , and collaborators Associate Professor Bruce Campbell, Professors Geoffrey Donnan, Graham Hankey, Mark Parsons and Christopher Levi. Professor Davis’ team will test new and current stroke treatments in a pre-hospital setting, use advanced brain imaging to assess their efficacy, study brain recovery and develop best practice strategies to triage and treat patients. “Together with my colleagues, we are determined to tackle the issue of how we can treat stroke faster and increase the uptake of available stroke treatments in urban and rural Australia,” Professor Davis said. In addition to the above accolade, University of Melbourne researcher and neurologist Associate Professor Bruce Campbell scored the highest ranked Career Development Fellowship – Clinical, Level 1. His NHMRC research aims to improve the effectiveness of clot busting drugs in stroke patients and reduce treatment delays by reconfiguring emergency services so that stroke patients are delivered to the most appropriate centre capable of treating their type of stroke. The three Elizabeth Blackburn Fellowships for the top ranked female fellows in biomedical, clinical and public health research were awarded to University of Melbourne affiliated researchers. University of Melbourne Professor Billie Giles-Corti, Director of the McCaughey VicHealth Community Wellbeing Unit at the Melbourne School of Population and Global Health, is undertaking urban and transport planning research that will inform how to create healthier, more liveable cities. Working in partnership with state and federal policy-makers and practitioners, she and her team are aiming to identify cost-effective urban planning interventions that encourage active living and reduce the risk of major chronic disease. Professor Jane Visvader, from the Walter and Eliza Hall Institute of Medical Research, is conducting research into the initiation and progression of breast cancer. University of Melbourne clinician-researcher Professor Robyn Guymer, at the Centre for Eye Research Australia (CERA), works on age-related macular degeneration, the leading cause of vision loss and blindness in Australia’s ageing population. Her colleague, Associate Professor Alex Hewitt, from CERA and the University of Tasmania, was awarded the top-ranked NHMRC Practitioner Fellowship. We also congratulate medical alumnus Dr Robert Commons (Menzies School of Health Research) on receiving the Gustav Nossal Award. 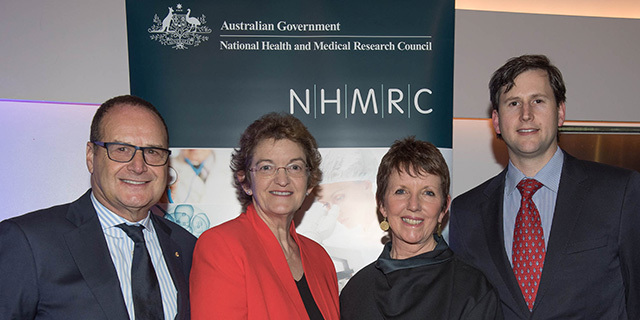 Click here for more information about the NHMRC Research Excellence Awards.